"All roads used to lead to Rome. Today, they lead to Beijing." Following the Silk Roads eastwards, from Europe through to China, by way of Russia and the Middle East, The New Silk Roads provides a timely reminder that we live in a world that is profoundly interconnected. In an age of Brexit and Trump, the themes of isolation and fragmentation permeating the Western world stand in sharp contrast to what has been happening along the Silk Roads since 2015, where the story has been about deepening ties and trying to work together. With brilliant insight, Peter Frankopan takes a fresh look at the network of relationships that are being formed along the length and breadth of the Silk Roads today, assessing the global reverberations of these continual shifts in the centre of power - all too often absent from headlines in the west. 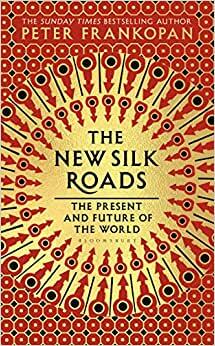 Start reading The New Silk Roads: The Present and Future of the World on your Kindle in under a minute. I enjoyed reading the author's first book, the silk road, and followed up immediately with this book. Big mistake. This book reads like a political commentary catered to readers with strong negative feelings toward the current US administration. The emphasis would be justified if brexit, Trump, and other similar events in the past few years turned out to be historical pivotal events, but we do not know, and this is a question best left to future generations of historians. As a fan of his first book, I wished he did not write this book. There are plenty of books on China's ambitions, there are plenty of books arguing for and against the current US adminstration, and there are no shortage of books on the US China relationship. This book adds neither new material nor insights. Other than the catchy title, I don't recall learning anything from reading this book. This is today's and tomorrow's front page news, but it isn't talked about much because other news steals the spotlight. Read it now. 4.0 out of 5 starsThe Rise of the East....too Early to Tell? When asked about the significance of the French Revolution, it is said that Zhou Enlai responded : “it was to early to tell”. It’s unclear whether this is an actual quote or just an urban myth. However, I feel that the thought could well apply to Peter Frankopan’s new book, “The New Silk Roads”. Peter Frankopan’s original work, “The Silk Roads”, published in 2016 was a masterpiece of history. It opened the eyes of Western readers to the fact that there is more to the world than just the history of Europe and, later, the new world. Too many western readers think that world history broadly covers the Roman Empire, Dark Ages, Crusades, the discovery of the new world, the US Civil War, two World Wars and then victory for the west in the Cold War. Frankopan shows this to be so myopic. There is a vast history to China and central Asia that too many students do not study. This is a great shame as it seems that the arc of history is bending back away from the west to the east. Indeed, this is the purpose of Frankopan’s new book. Despite the strength of the argument, to write a “sequel” only two years after the original books is overly ambitious to say the least. A longer perspective is required. In other words, while the world economy may be increasingly dominated by China and the east, it is too early to conclude that this is inevitable. While Frankopan’s book is well written and a delight to read, we need more time to develop any firm conclusions. Having said this, I would still recommend both books to any reader with an interest in world history. Both books are provocative. Both books challenge orthodoxies. For this alone, Peter Frankopan must be commended.